Marguerite Duras was never keen to allow cinema an easy route out. Adapting her own stories into feature films, it seems that the writer, rather than compromise the ghostly qualities of her books, experimented and destabilised the narrative aspects of film form to suit her needs. Like her contemporary, Alain Robbe-Grillet, Duras made many attempts to transplant the elements of voice from her work into the narrative form of film, usually involving one specific technique: the detaching of the voice from the body. Much has been written of the disembodied voice, especially in audio-visual theory that focuses heavily on the surreal presence of voice-over dialogue in popular cinema (with particular interest in film noir), but Duras’ constant striving to make the form fit her own visions of narrative perception often meant that her work defies some of the more conventional sound hierarchy theories. When first watching her brilliant 1975 feature, India Song, a certain sense of the uncanny was present from the very start. It was only some way into the film that it became clear as to why this was; that the voices we hear the characters communicate with are in the soundtrack rather than diegetic. The narrative is opaque and, rather like Robbe-Grillet’s Last Year In Marienbad, it follows a group of interconnected characters wandering through a large mansion, almost dreaming of each other. Actors such as Delphine Seyrig and Michel Lonsdale look on at each other, seeming to act the meaning of their dialogue but never opening their mouths to talk. There could be several reasons for this but chiefly the decision seems part of Duras’ overall project in playing with the voice-to-narrative relationship. The overriding feeling that comes with India Song, even with the luscious costumes and splendour, is that the film’s visual is dramatically within the past tense; that we are watching ghosts looking back, the glamorous dead. Duras’ smaller scale films use similar techniques. In many of her shorter films, the voice is again disembodied but even less attached to any sense of ownership of the narrative. In her 1981 film, Agatha And The Limitless Reading, a similar scenario to India Song is played out in a desolate seaside resort. The rupture is even more exaggerated, perhaps to highlight the film’s role as an essay, with cameras being seen in mirrors and with actors (including Bulle Olgier) almost improvising their way physically around the large rooms and wintery beachscapes. The fact that the narrative is about the addressing of childhood memories, including an incestuous relationship, perhaps begins to explain why this technique, a distancing effect if anything, is opted for by Duras. The traumas – sexual, colonial, and emotional – are almost too dramatic to face head on and would be rendered melodramatic by their strict recreation. Duras slips the characters into the past, the present always off screen visually but there through voice. The sound of the voice, often Duras’ own, highlights the disjoint in time between what is being seen and what is being discussed. The same seaside resort can be found in a number of her films though not always using the same technique. The ensemble drama, Woman Of The Ganges (1974), uses the same set-up but keeps the dialogue and the visual attached, creating a lesser effect, as does Baxter, Vera Baxter (1977). The disjoint is kept for the short film, L’homme Atlantique (1981), made at the same time as Agatha. The main character’s voice is lost entirely and given over to Duras’ voice-over instead. The disjoint frames the film even further as an essay; her writing style has often been to find drama in essayistic styles of writing and the same rings true for her films. In Agatha in particular, the questioning begins to highlight the very process of the filmmaking, almost as if Duras is satirising the form or at the least questioning its legitimacy for dealing with personal, dramatic issues (the same issue that Michael Haneke has been dealing with since his very first feature). The fact that this technique is kept in spite of using some of the most famous of French performers working then and now shows how important this questioning is for her. Perhaps most interestingly, the form breaks down most, not with a disjoint between the aural voice and the visual narrative, but in a film where the voice is retained. In Le Camion (1977), the structure, whilst having the voice disembodied throughout several shots of a lorry on a journey, is grounded by Duras herself reading and discussing the script of her film with Gérard Depardieu. Even if the disjoint is, on an aesthetic level, lesser in this case because the sound can always be reframed back to the diegesis of the drawing room where the reading takes place, the film is the most temporally fluctuating of Duras’ features. The disjoint here instead comes from the inverting of the filmic process, amalgamating a practical element of the film’s production (the initial script reading and analysis) into the very narrative itself. 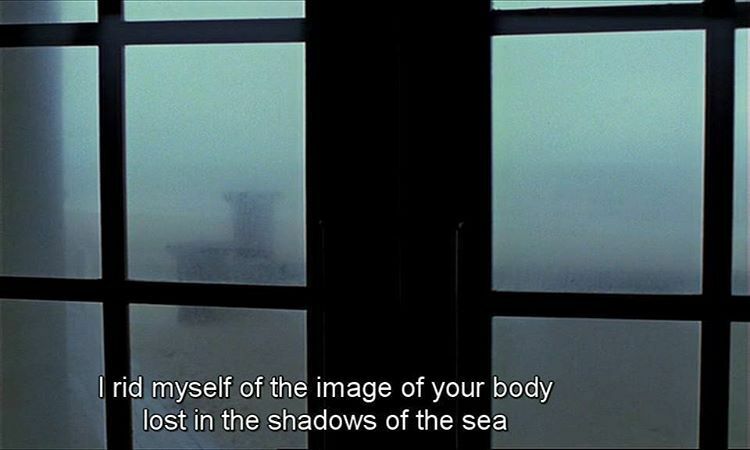 More so than simply allowing a camera to be shown in the reflection of a mirror, Duras breaks apart the whole of the filmic process, à la Jean-Luc Godard, allowing access to the emotional resonances within the themes of the work but through an open break that speaks of an unusual level of trust in the viewer’s ability to read the film. Duras may be more known for her extraordinary body of humane, experimental writing but her film work is equally filled with such disjoints, carried off with same confidence and skill as any of the better known figures known for equally disrupting the cinematic form with such bravado.